It is this time again! The Island Fever Rally is this weekend, and we couldn’t be more excited! 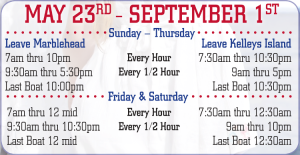 I just wanted to update you on the activities we have set for this weekend. **Round trip should only cost you about $100 per couple. • And MUCH MUCH MORE exciting things to do and see! There will be group meals hosted for the Rally as well. 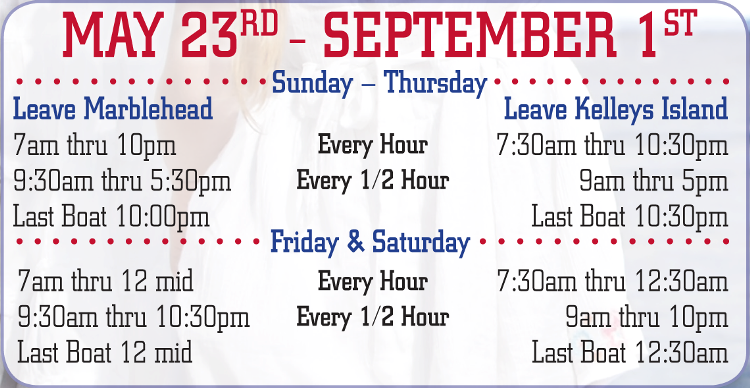 We plan on preparing Breakfast and Dinner on Friday, Saturday, and Sunday for the whole group. Paula Christopher will be in charge of the menu, so you know it will be great! All campsites are reserved for the members. Please be sure to bring a check or cash to pay for the Rally fee and the campsite. The Christophers do plan on hitting the road by 4:00 pm on Thursday to hopefully make the 6:00pm ferry over to Kelleys Isalnd. Please feel free to meet them at that time, if you want to go over together. Thank you very much!!! 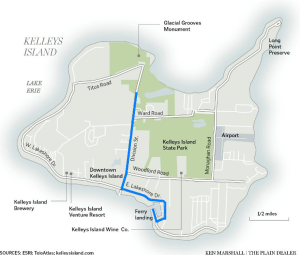 And have a wonderful time at Kelleys Island!!!! We are excited to announce our second trip to Mount Union! We had such a blast last year that we needed to do it again! 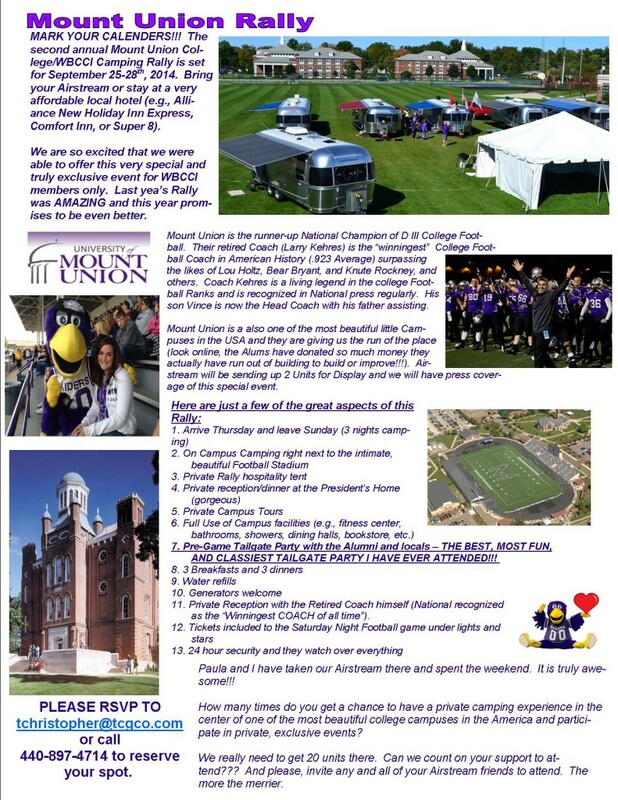 Come camp with us on the beautiful campus on Mount Union and join in the football fun! Clear your calendar from July 23rd to the 27th because it is Wine and Falls time! 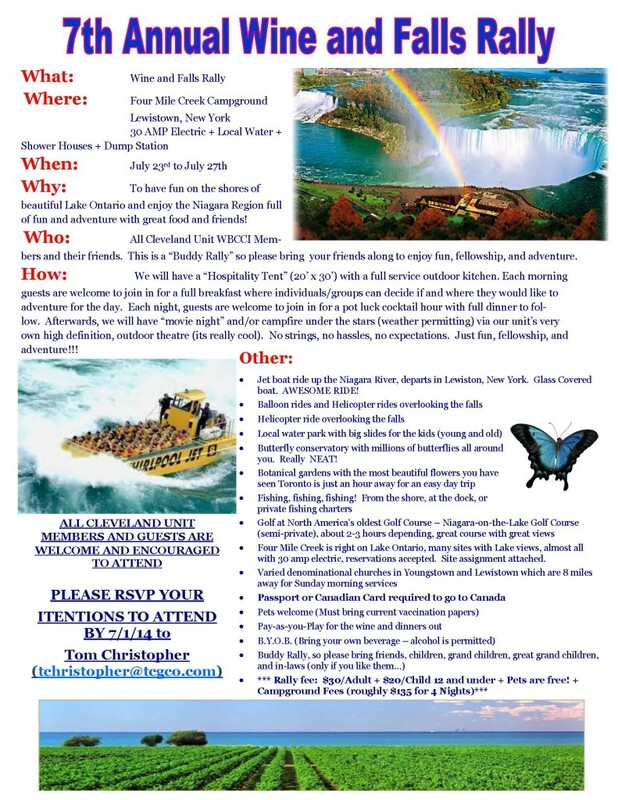 For the 7th year we will be going to Four Mile Creek New York State Park and it going to be a blast! This Rally has something for everyone of any age! Jet boat rides, a great water park, botanical gardens, and of course beautiful camp grounds! Limited spots have been reserved for this event so RSVP quickly. Please send confirmations to Tom Christopher (tchristopher@tcgco.com) or Kelly Ott (kellyo@tcgco.com). 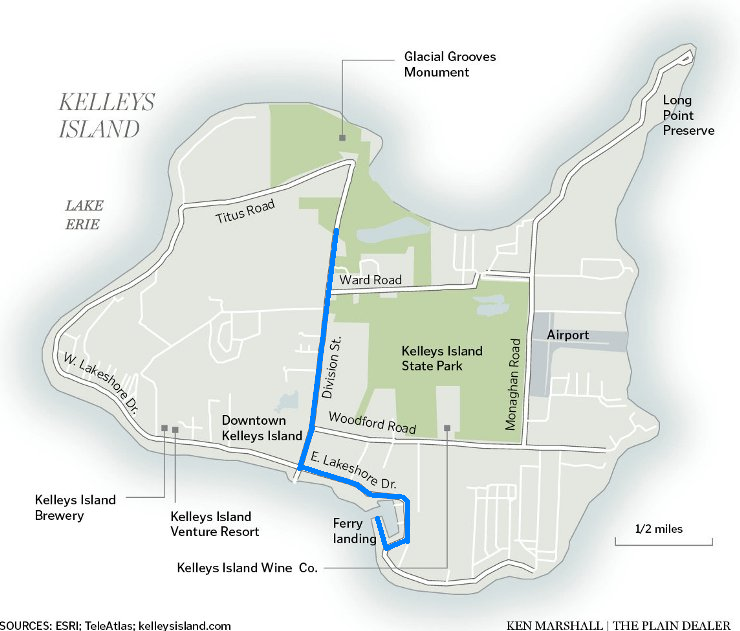 We are excited to announce the 2nd Annual Island Fever Rally at the beautiful Kelleys Island! So clear your calendar from June 5th to the 9th. 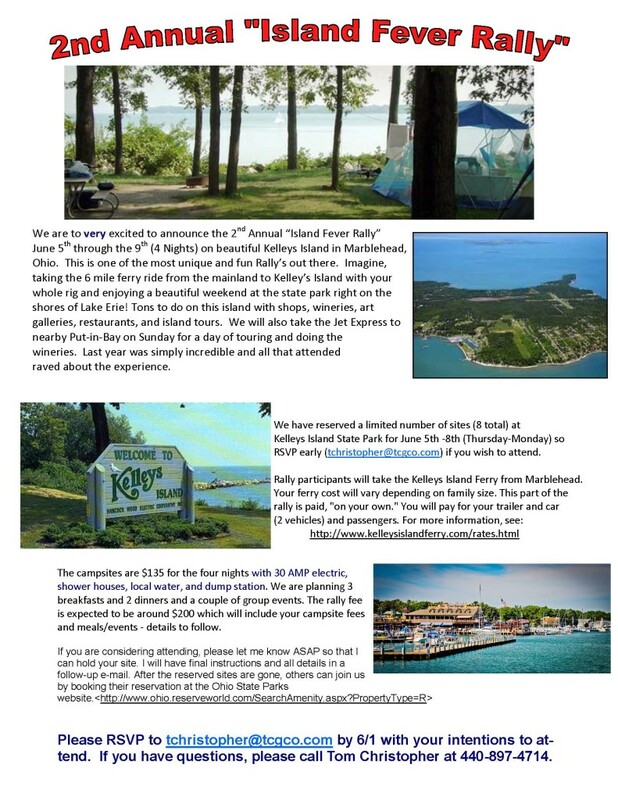 Please contact Tom Christopher (tchristopher@tcgco.com) or Kelly Ott (kellyo@tcgco.com) to confirm your spot on our island adventure. Please find all details in the posted flyer. Schedule for 2012 Announced; First Rally to introduce new format! The Executive Committee has gotten its heads together and come up with an exciting array of Unit activities for 2012. All the Rallies are listed in both the “rally page” on the menu or via the Calendar link. The Calendar link will allow you to find out more details on arrangements if you click on the activity listed in the calendar. The details for the first rally — The Spring Shakedown — reveals a new kind of low key, low planning format for some of our outings. Rather than push for commitment to a set number of overnights with a specific rally charge to pay for some shared meals or activities, the “Rest and Relaxation” format allows you to show up when you can and to pool food resources for breakfasts and dinners e.g., a pot luck arrangement. Also, there will be no schedule of daily activities but, rather, options for daily visits or activities as folks decide “in the moment”. We hope this format will encourage involvement and participation. It also reduces the work to be done by a sponsoring couple. Get you personal calendars out and book some fun times with fellow Airstreamers! A good turnout of 50 Airstreamers gathered at the Pine Lake Trout Club in Chagrin Falls, OH for the unit’s annual Christmas party. Hosted by the 2012 President, Tom Christopher — with assistance from Sandy and Bill Johnjulio — the event offered good food, camaraderie, and a special DVD compilation of past Cleveland Unit rally photos. New officers were installed and prizes were offered for longest running membership (Bud and Conna Whitmore) as well as longest marriage (Ron and Marion Paugh). Tom Christopher also over viewed plans for 2012 rallies and luncheons. Details on officers are listed under that title in this site’s menu and the rally schedule is now updated with events for 2012. The new year will bring a range of club activities with built-in flexibility that should allow all members to participate. Fun, Fellowship and Adventure are guaranteed! Tom and Paula Christopher again held a get-together at their lovely home in Kirtland to allow new members to get to know the WBCCI Cleveland Unit in a fun and low-key environment. With 58 people in attendance, there was a good mix of old and new members. Tim Caillet, our member who works at Sirpilla RV, ran a tutorial on winterizing your Airstream in advance of the fun and games. Nineteen folks attended that learning session. It was such a success that we will ask Tim to run some sessions during 2012 at some of our rallies. With a number of new members in 2011 and several lined up for 2012, we expect the total membership to be 70+ “units” (that’s RVs, not individuals) before too long. Clearly this new member get-together is a great way to introduce new folks to the WBCCI “life-style”.